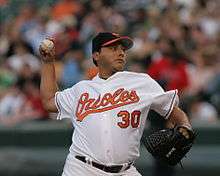 Russell Reid Ortiz (born June 5, 1974) is a retired Major League baseball pitcher. Ortiz played for the Atlanta Braves, Arizona Diamondbacks, Baltimore Orioles, San Francisco Giants, Houston Astros and Los Angeles Dodgers. He is 6 ft 1 in (1.85 m) tall, and weighs 220 pounds. Ortiz attended Montclair School in Van Nuys, California before he continued on to the University of Oklahoma. In 1994, he pitched for a Sooners squad that would win the College World Series. In 38 innings, he had three saves and 30 strikeouts. The right-hander was selected by the San Francisco Giants in the 4th round of the June 1995 Major League Baseball draft. He was drafted as a closer, but converted to the starting rotation while in the Giants' farm system. On April 2, 1998, Ortiz made his major league debut in relief, collecting four strikeouts over two innings. The rookie bounced all over the Giants pitching staff and between San Francisco and Triple-A Fresno, working in relief, out of the rotation and in the minors as injuries and inconsistency plagued the Giants rotation. In 1999, Ortiz came into his own and held on to his spot in the Giants' rotation, jumping on the scene as one of the National League's premier starters. His 18 wins was good for a tie of 4th in the NL and was in the top 10 in the senior circuit in many other pitching statistics. 2000 was a tale of two seasons for Ortiz, as he was rocked hard before the All-Star break to a tune of 3 wins, 8 losses and 7.55 ERA falling out of favor with manager Dusty Baker. He allowed 10 runs in a game versus the Milwaukee Brewers on May 21, 2000. Despite the ten runs, Ortiz won the game as the Giants outslugged Milwaukee 16–10, making Ortiz the first pitcher since Bob Friend in 1954 to allow 10 or more runs and still earn a win. Injuries in the second half of the season gave Ortiz the opportunity to redeem himself, and the California native shined. His 10–4 record and 3.22 ERA after the mid-summer classic helped San Francisco into the National League playoffs, and Ortiz started Game 3 of 2000 NLDS versus the New York Mets. Ortiz returned to form in 2001 owning a 17–9 record a solid 3.29 ERA, anchoring the pitching staff, for a competitive Giants squad. He also set career highs in innings (218.2 innings) and strikeouts (169). 2002 would prove to be another good effort on Ortiz's part as he and the Giants came within one game of a world championship. Yet again, Ortiz had another stellar second half effort helping the Giants capture the 2002 NL Wild Card. His personal six-game winning streak down the stretch propelled San Francisco into the playoffs and Ortiz captured two more victories (with a 2.19 ERA) over Atlanta in the Division Series. He was not as successful however in the NLCS versus St. Louis surrendering four runs in 4.2 innings in Game 3 of that series. The World Series versus the Angels also featured two polar opposite games for the starter. The Halos shelled him for 7 runs in Game 2 of the World Series, as the Giants went on to lose 11–10. He returned to pitch the pivotal Game 6, and again redeemed himself working 6.1 innings of two-hit baseball. Manager Dusty Baker gave him the game ball when he took him out, assuming they would hold on to a 5–0 lead. The Angels came back to win the game by a final score of 6–5, and went on to win the World Series in 7 games. Ortiz landed on the trading block in the 2002 offseason and was dealt to Atlanta for pitchers Damian Moss and Merkin Valdéz on December 17, 2002. United with pitching guru Leo Mazzone, Ortiz put together a spectacular season, going 21–7 with a 3.81 ERA and collecting his only All-Star nod. With Ortiz as staff ace, the Braves won their 12th consecutive NL East title, and Ortiz took fourth place in the NL Cy Young voting. In a demonstration of how far the pitcher had come, Ortiz pitched a 1–0 complete game shutout and knocked in the game's only run against the eventual world champion Florida Marlins. Ortiz lost Game 1 of the 2003 NLDS against Chicago however, but once again bounced back to win Game 4 and force a deciding Game 5 that Atlanta would lose. Ortiz displayed more pitching prowess in 2004 helping Atlanta to another division title while collecting a 15–9 record, with a slightly inflated 4.19 ERA. Another stellar late season game came in Montréal on September 4, as Ortiz carried a perfect game into the 6th inning and allowed only two Expos to reach second base in the complete game 9–0 shutout. That improved Ortiz to 5–0 with 1.13 ERA against the Expos in 2004. Still, Ortiz and the Braves could not advance past the first round of the playoffs as he was clobbered by Houston for 5 runs in 3 innings as the Astros advanced. Ortiz was on the move again in 2005, this time to Arizona as the Diamondbacks tried to overhaul their starting rotation and line-up after a 111 loss season the year before. Arizona's hefty four-year, $33 million deal lured the righty to the desert. The pitcher who had never spent as much as a day on the disabled list in the previous seven seasons, battled a rib fracture after winning four of his first six games for the D-Backs. When he returned from the disabled list, Ortiz proceeded to lose six straight decisions and ended the year on a 1–9 slide. 2006 saw another injury (this time to his calf) and more poor pitching performances. On June 13, 2006, Ortiz was designated for assignment by the Diamondbacks as he sunk to 0–5 with an ERA of 7.54. The five losses contributed to 1–14 mark from May 2005 to May 2006, and the Diamondbacks simply could not afford to allow Ortiz to work out his issues at the major league level. With nearly $22 million and over two-and-a-half years remaining on the contract, Arizona's cut of Ortiz is thought to be the most expensive release in Major League Baseball history. On June 25, 2006, the Orioles signed Ortiz to a one-year deal. His first start for Baltimore and in the American League ended in a no decision on July 1 against one of his former clubs, the Atlanta Braves; but by the time the season ended, Ortiz had compiled a record of 0–8 with an ERA of 8.14. To his credit up to this point, in 251 career games (241 starts) and 1,483.2 IP, Ortiz had 108 career wins to 76 losses, and an overall ERA of 4.28. He also had 1,072 career strikeouts to 773 walks. Ortiz had been a decent batter (for a pitcher) with a .208 lifetime batting average and 96 hits in 462 at-bats. He also had 22 career doubles, 6 career home runs and 44 total RBI. The pitcher also had a solid glove, committing only four errors in over 1,400 innings of work. Ortiz was picked up by the Giants on January 9, 2007, and signed to a one-year contract for $380,000 to compete in spring training for the fifth starting position in the Giants' rotation. San Francisco general manager Brian Sabean noted that Ortiz while pitching winter ball in Puerto Rico showed both increased velocity and renewed movement in his pitches and was signed on that basis. Ortiz won the fifth starter spot with an excellent spring training, posting a 3.00 ERA – over five points lower than his regular season ERA the previous year – in 18 innings pitched. In his second regular start, he posted his first win since 2005, and in his third start, he won again, this time defeating the Diamondbacks, who were still paying Ortiz the large majority of his salary. However, later in the year, Ortiz was placed on the DL for an inflamed elbow, and when top prospect Tim Lincecum shined in his place, Ortiz was sent to the bullpen after his return. Ortiz was later placed again on the DL for a forearm strain and he returned in early August. On August 21, 2007, Ortiz left a game in the 5th inning after throwing three balls. Ortiz appeared to be suffering from elbow pain. Ortiz had missed 73 games in 2007 before this injury. Ortiz underwent Tommy John surgery, and missed the entire 2008 MLB season. On January 13, 2009, the Houston Astros signed Ortiz to a minor league contract with an invitation to spring training. Ortiz won the job as the fifth starter for the Astros with a 3.18 ERA in seven spring training games. Pitching in relief on April 8, 2009, he gave up a three-run home run to Mike Fontenot on his first pitch in an official major league game in almost two years. However, after struggling in his first outing, Ortiz started this season 2–0. After that he went 1–6. He had a record of 3–6 with a 5.57 ERA on July 30, 2009 when he was released by the Astros. On August 5, 2009 Ortiz signed a minor league contract with the New York Yankees. He reported to AAA Scranton/Wilkes-Barre and joined a minor league starting rotation. On August 17, Ortiz opted out of his contract with the Yankees to become a free agent. On August 22, 2009 Ortiz signed a minor-league deal with the Colorado Rockies and assigned to the Triple-A affiliate Colorado Springs. After going 0–1 with a 7.07 ERA for Colorado Springs he was released by the Rockies on September 5, 2009. On January 8, 2010, Ortiz signed a minor league deal with the Los Angeles Dodgers with an invite to spring training. After good performances in spring training games, Ortiz was added to the Dodgers Major League roster to start the season. He was 0–1 with a 10.29 ERA in six appearances for the Dodgers and then was designated for assignment on April 18. He chose to decline a minor league assignment and became a free agent. He announced his retirement shortly afterward. Ortiz resides in Mesa, Arizona with his wife Stacy, two daughters Grace Elaine and Lilian Reid and son Hudson. In high school he was a teammate of future major league DH Brad Fullmer. Fullmer's Angels faced off against Ortiz' Giants in the 2002 World Series, and a 7th inning, Game 6 single by Fullmer chased Ortiz from the game (despite the Giants being up 5–0 at the time). Anaheim would rally to win the game 6–5 and eventually the World Series four games to three. He is the creator/owner of 2nd Guy Golf. 100 percent of proceeds from sales go to charity. ↑ Schulman, Henry. "Ortiz struggles to keep his pitching arm right." San Francisco Chronicle. Tuesday, August 21, 2007. http://www.sfgate.com/cgi-bin/article.cgi?f=/chronicle/archive/2007/08/21/SP4VRLUV0.DTL. Accessed on August 21, 2007. ↑ "Ortiz invited to Astros camp". espn.com. Associated Press. 2009-01-14. Retrieved 2009-01-14. ↑ Alyson Footer (2009-01-13). "Astros sign Ortiz to Minor League deal". MLB.com. Retrieved 2009-01-13. ↑ Alyson Footer (2009-04-04). "Astros set roster; Ortiz cracks rotation". MLB.com. Retrieved 2009-04-13. ↑ Jose De Jesus Ortiz (No Relation) (2009-04-09). "Rough Start sinks Astros in Series Finale with Cubs". MLB.com. Retrieved 2009-04-09. ↑ Thomas Harding. "Rockies to sign Ortiz". Retrieved 2009-08-23. ↑ Ken Gurnick. "Dodgers sign Ortiz, Restovich to Minors". Retrieved 2010-01-08.